Dress shirts are important to any man’s wardrobe, but choosing a quality dress shirt made in the USA isn’t easy to do. That’s why we took the time to research and find some of the very best dress shirts made today. Our findings are below – enjoy! During our time reviewing major brands from places like Texas, North Carolina, and South Carolina, we were impressed with a few options more than others. The Ratio Clothing dress shirts stood out because of how extensive the customization options offered are. We loved the eco-friendliness of Dirtball Polo shirts and the practicality of the Alial Fital polo dress shirts, among other brands. We split up all of our recommendations by category – hopefully you’ll be able to find some great shirts to add to your own wardrobe. Below we break down all of our top picks giving you tons of details on each one, including what we liked and didn’t like. Each of these shirts are crafted in the USA and they offer something a little special. Taking your look to the next level is simple and comfortable with Alial Fital polo shirts. We love the stately appearance of these shirts – they have the appearance of a classy dress shirt, but offer the comfort of a traditional polo. This is largely because each shirt features collar stays and a sewn-in collar stand for that classy lift that high quality dress shirts are known for. Alial Fital makes their shirts from super breathable material, which was super comfortable in our testing – you won’t be sweating like crazy when you wear this shirt on a hot summer day. Founded to make up for all the low-quality clothing being shipped from overseas, Blackland Clothing is a top-notch American clothing company that focuses on strength, durability, and quality above all else. They produce oxford shirts that we really like for their feel, their durability, and of course their appearance. Blackland’s shirts are made from 100% cotton and they breathe super well. Each shirt has a ton of care put into it as well – tough 2-ply construction and careful stitching with high quality thread. Blackland Clothing oxfords are produced in South Carolina and they also come with integrated collar stays to keep the collars looking crisp and neat. Collared Greens is an American dress shirt maker that focuses on crafting environmentally-friendly clothing. We love the shirts because they are 100% cotton and have a wonderful tailored structure that’s tapered for a nice professional fit. The shirts all come with a tasteful button-down collar and they’re offered in a wide range of print styles and colors for plenty of options. These shirts are a real bargain compared to the other options on our list – for the quality level you’re getting, we think that the price of each is super awesome. Each of the shirts is crafted in Pennsylvania and shipped from there around the country. The shirts are affordable and worth investing in because they hold up well and they’re simple to maintain compared to more delicate dress shirts. 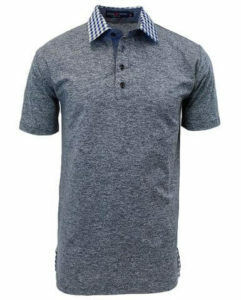 Dirtball Polo shirts are something that you can feel really good about purchasing for several different reasons. For one, these attractive shirts are comfortable and built to last. They’re clearly high quality and made with care to leave you with a product that you can depend on. Second, these shirts are made from a mix of recycled cotton and water bottles, making them very eco-friendly. Approximately 65 recycled water bottles are used during the production of each of these shirts, and they’re surprisingly comfortable. 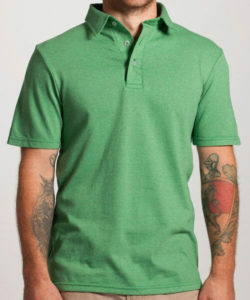 The fit of this polo is also spot on – you’ll feel good on the inside and out wearing a Dirtball Polo. 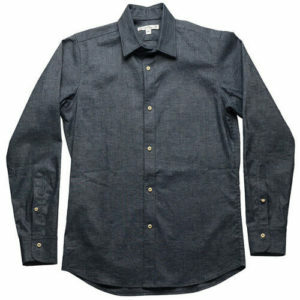 Gitman Brothers makes an impressive button down oxford shirt that offers a nice neat look, and a high level of quality. We were really impressed by the attention to detail in the stitching – these shirts will be a mainstay in your business or casual wardrobe for a long time. We love all the different size options these shirts come in. By carefully choosing between tailored, regular, and classic fit, your collar size, and your sleeve size, you can get an exact fit that will conform to your body type well. Each of these shirts is made from 100% cotton and they’re durable and breathable. They come with a barrel cuff and a button down collar for maximum style. Gitman oxford shirts are an impressive staple for any wardrobe and they offer a good balance between classic and modern looks. Hemp has long been known for being environmentally friendly and for being a tough material. If tough rope can be constructed from hemp, so can a reliable shirt, and that’s exactly what you get from Glass House, which is manufactured in New York City. 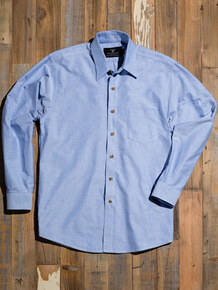 Their hemp and recycled poly chambray shirts are designed to look nice, but more importantly to hold up really well over time. We love that these shirts are made in the USA, and that they have a precision tailored fit design. They have a very nice form-fit to them, and feature added design elements like a hand cut split yoke (read: a little bit extra fabric for better mobility) or rounded barrel cuffs for some sweet style. The shirts are made from a mix of hemp, recycled plastic, and spandex, and they are surprisingly soft while offering just enough stretch for comfort. Good plaid shirts are difficult to find, though they’re a versatile staple that’s good for any man’s wardrobe. 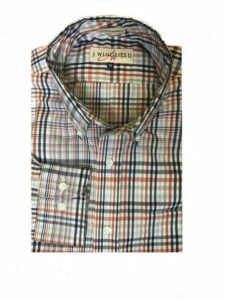 J. Wingfield offers high quality plaid shirts that are 100% made in the USA. These shirts stand out for their comfort and for their long-lasting durability. We love that these shirts are made from 100% premium cotton that has a soft touch, and also a very durable feel to them. The shirts come with in a spread collar design made for comfort and a casual look that we really liked. Every one of these shirts is sewn in the heart of Texas. The Mizzen + Main Manhattan shirt is an absolute staple for a wedding – classic design, moisture wicking, and breathable. These shirts are stretchy thanks to their 15% polyester construction, so they have a nice snug fit. 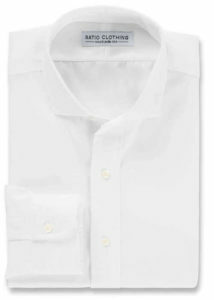 The are wrinkle resistant and machine washable, making them much easier to maintain than your everyday dress shirt. We love the moisture wicking material used for these shirts and how breathable they are as well. They’re comfortable even for use on a warm day, making them perfect for outdoor events. Each of these Manhattan dress shirts is available in a huge range of colors and patterns outside of the traditional white, but more importantly they are available in a wide range of sizes and fits for a nice tight form-fit for everyone. Good dress shirts are nearly impossible to find, especially shirts that are going to fit your specific figure perfectly. Fortunately, Ratio Clothing makes it possible to create your own with their help. 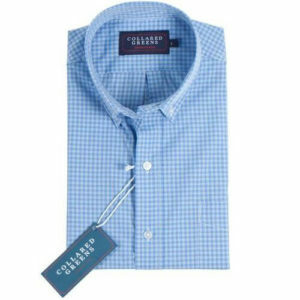 The company specializes in custom shirts that you detail to get just the right fit for you. Each of the shirts on the list are made in North Carolina from a heavy cotton fabric, and they’re designed with a classy fused collar, collar stays, and a flexible two-piece yoke (but they can be customized to suit your own preferences). When creating your own shirt you’ll choose from different collars, cuffs, shirt fronts, pockets, buttons, and you’ll have an option to add a monogram as well. There’s even a detailed sizing process to get a custom-tailored fit just for your body type. The end result is an impressive dress shirt styled just the way you want with all the right accents and designs. We spoke to Eric Powell, the founder of Ratio Clothing, who had this to say about why they choose to make their shirts in the U.S.: “We believe that making our products in the U.S. allows us to deliver a better experience to customers and a higher-quality final product, while at the same time supporting much-needed manufacturing jobs within the U.S.” When we asked him about the feedback he gets from other customers, he mentioned their “dedication to providing the absolute best experience in online custom clothing,” which we agree with when we went through that process. What you really want to avoid is materials like polyester, which tends to make shirts look shiny and cheap, plus they aren’t as breathable. 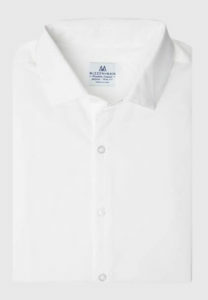 Also look out for shirts that say “non-iron” – typically a tip-off that they used some sort of treatment on the shirt that isn’t breathable and is made of cheap material. As we mentioned above, stitching is super important as well. Some manufacturers will cut corners and use low quality or thin material to sew the shirt together, or even worse, use some sort of glue to try and “finish the job.” Avoid these shirts at all costs. Style also comes into play here – you likely aren’t going to wear a super heavy material like twill during the summer. Finding the right fitting dress shirt for the office or just to wear around casually is super tough. We looked for shirts that offer many different size options and a tailor-fit product that’s designed to conform to the body well during use for comfort and style. When it comes to choosing a quality shirt it’s all about the details. Shirts should have neat stitching that’s in excellent condition and in straight lines. Careful edge stitching should be done and hand sewn cuffs should be used whenever possible. Dress shirts don’t have to be uncomfortable – we looked for features that will make them a pleasure to wear. Besides ensuring the shirt material is nice and soft, we looked for shirts that are flexible, have a built-in split yoke for added range of motion, and have moisture-wicking properties that will help keep you cool when it matters most. Of course we can’t forget style! Since everyone’s tastes are different, we looked for brands that offer a wide variety of style options, or have shirts that are timeliness – like a traditional white or blue oxford print. Speaking of style, make sure to check out our other guides to complete your wardrobe, like our picks for the best belts made in the USA and watches made in the USA.